Q. 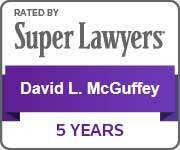 Can the Elder Law Practice of David L. McGuffey help me? A. Yes. In addition to Medicaid and other long-term care planning, the Elder Law Practice of David L. McGuffey can educate you and help you plan for your future. Among other matters, we can help you with revocable and irrevocable trusts, wills, powers of attorney, health care advance directives, guardianship and probate proceedings, contracts, deeds, and family feuds. We can provide advice and education regarding Medicare claims and appeals, Social Security disability claims, Supplemental Security Income claims and appeals, insurance coverage disputes, health advocacy and long-term care placement, and elder abuse. We also do special needs planning for individuals with special needs. Certified Elder Law Attorneys understand the legal needs of the elderly and individuals with special needs, but they also understand the people they are helping. They have practical knowledge that allows them and their staff to ignore the myths relating to aging and the competence of the elderly. They work to preserve individual dignity, understanding that you are an individual rather than a diagnosis. Certified Elder Law Attorneys know about real life problems, health and otherwise, that tend to crop up as persons age. They are able to network with a formal or informal system of social workers, psychologists and other elder care professionals who may be of assistance to you. They use their knowledge, experience and relationships to help you resolve your problems. For more information about how a Certified Elder Law Attorney can help you, visit the National Elder Law Foundation website. Q. What is long-term care? A. Long-term care is “extra help” getting through the day. It involves a variety of services designed to meet a person's health or personal care needs during a short or long period of time. Long-term care is not considered “health care” so it is not covered by most health insurance policies or by Medicare. Often, long-term care is described as assistance with activities of daily living (ADLs), which are: feeding oneself, toileting, grooming, dressing, continence care, bathing, and ambulation (such as moving from bed to wheelchair). Q: What are Medicare and Medicaid? A: Medicare and Medicaid are government-sponsored programs that reimburse heath care providers when they provide covered goods or services. Medicare is a federal entitlement program for the disabled and people aged 65 or over. Medicaid is a federal-state welfare program for low-income and low-asset families with children as well as the needy, aged, blind and disabled. Q. Do I have to go to a nursing home? A. No. There is no rule requiring you to go to a nursing home, and your children are not required to admit you to a nursing home. There are rules that prohibit abuse or neglect, but as long as your needs are being met, you can get care anywhere. The real issue is whether it’s smart to stay home. If you insist on your child taking care of you at home, and if your child agrees, then you are placing your child at risk of injury, lost income, lost time with his or her spouse, lost time with his or her own children, and you have probably diminished your relationship with him or her because now he or she is spending time as your servant instead of holding your hand, talking with you, enjoying your company and loving you. If you are a child trying to keep your parent home, you have all of these risks including the additional risk that your parent won’t get the right care because you are burned out or because you don’t have enough knowledge provide the right help. The real issue is whether staying home is a healthy situation for you and your caregiver. Even if it works for now, that decision needs to be reviewed regularly. Q. How much does long-term care cost? A. It depends on how much care you need and where you get care. Genworth publishes an annual survey of long-term care costs, and the average in this area (in 2015) is about $7,000 per month for nursing home care or $84,000 per year. The average length of stay in a nursing home is 2.4 years, so the total cost of an average stay would be around $201,600. Assisted living care averages between $35,000 and $45,000 per year. Homemaker and home health services average between $38,000 and $46,000 per year. Q. How do you pay for long-term care? A. In general terms, there are four ways to pay. Medicare will pay for a maximum of 100 days in the nursing home (but only the first 20 at 100%) if you have a qualifying hospital stay. After that, Medicare stops paying. Medicare does not pay for assisted living care and only pays for approved home health care if you need skilled therapy. If you have long-term care insurance, it will pay for those goods and services covered in your insurance agreement. Of course, you can use your own money to private pay. The last way most people pay is by qualifying for Medicaid. If you are a veteran, then you have a fifth option, which is Aid & Attendance. Q: Can I transfer my assets to my children just before I go into a nursing home and still qualify for Medicaid? A: Probably not. Medicaid's 60-month Lookback Rule will, in most cases, result in a penalty if you give away your assets for less than fair market value within 60 months before applying for Medicaid benefits. A related question many people forget to ask is "what if I don't get sick." Can you give away your assets and then get them back? Once you have given away your assets, they do not belong to you any more. Not only do you lose your legal right to get them back, but your children's creditors might acquire rights in your assets. There are many risks out there, so giving your property to your children doesn't protect it. What if your children get divorced, lose their jobs and spend your money, go bankrupt, get sued. etc.? The Elder Law Practice of David L. McGuffey can help you evaluate your options. Q. Does the source of payment affect the quality of care? A. No. Federal statutes and regulations prohibit nursing homes from discriminating against residents based on the source of payment. See 42 C.F.R. § 483.12(c)(1). A. Stop there. If you got your information from anyone other than an Elder Law Attorney, it’s probably wrong. Myths and rumors abound regarding Medicaid and 99.9% the information you received from the neighbor lady across the street is wrong. One reason it’s wrong is because the rules change. Another is because non-lawyers don’t understand that it’s not just the Medicaid rules: you also have to understand, among other things, property law, contract law, probate law, tax law and administrative procedure. Recently, a nursing home employee told someone we met that the sick spouse could not get Medicaid because the healthy spouse’s income was too high. Wrong. An attorney who is not an elder law attorney told someone to give away money and apply for Medicaid without telling Medicaid. Wrong (unless you want to go to jail for Medicaid fraud). We met someone who was told they could not get Medicaid because they had a term life insurance policy with no cash value. While it might present other challenges, that answer was wrong. This is just a sample of the incorrect information floating in the community. If you want answers to legal questions, ask a lawyer. If you want to know about Medicaid, ask a Certified Elder Law Attorney. Q. When should we start planning? A. It’s never too early to start planning. Likewise, it’s never too late to plan. But if you come to the dance late, we can still help you, but you’ve limited our options. Keep in mind that time is one of the tools we use. Think about your goals and give yourself enough time to achieve them. Q. How much time does it take to do good planning? A. It depends on what you want to accomplish. The answer is that every plan is different so it takes as much as your plan requires. Q. Can you help us identify a good nursing home (or assisted living facility)? A. Yes. We have many contacts. You can also use the “nursing home compare’ tool at medicare.gov. Q: Am I eligible to receive Medicare or Medicaid benefits? A: Eligibility for Medicare is linked to eligibility for Social Security; both programs look to see whether you worked enough quarter hours and paid into the system. Assuming you did, if you are age 65 or older, have been disabled for at least two years or have chronic kidney disease, you are probably eligible to receive Medicare benefits. Medicaid is different. Medicaid is a welfare program that pays for covered health services. Generally, Medicaid beneficiaries must be over 65, blind or disabled, and must also have low income and low assets. Although it is a federal-state program, the Medicaid program is administered on a state-by-state basis, so the eligibility rules are different in each state. Q: Is it illegal to transfer assets for the purpose of obtaining Medicaid benefits? A: No, but there’s a caveat to that statement. There is a law on the books that makes it illegal to provide advice telling people how to plan for Medicaid eligibility. A federal judge, in New York Bar Association v. Reno, held that the law was unconstitutional. In 1998, Attorney General Janet Reno declared that the Justice Department would not enforce the law as it violated the attorneys' right to free speech. Some federal courts have supported that position. Thus, there is currently no risk of criminal prosecution under the law. Q. Can I spend my money and still get Medicaid? A. Yes.There is no rule against spending your money. In fact, there is no rule against spending your money unwisely. You could, for example, go to a casino and gamble your money away (as long as you do the gambling yourself) and still get Medicaid. The problem, though, is once it's spent you have nothing left but Medicaid. Our suggestion is that you contact us and let us help you develop a plan that acheives your goals and gets you the best care possible. Q: What is long-term care insurance? A: Long-term care insurance is a private insurance policy purchased to cover long-term care needs, such as home care provided by a paid caretaker, assisted living facilities or nursing homes. While often times quite expensive, long-term care insurance can save a substantial amount of money when compared to the rising costs of long-term care. To determine if long-term care insurance will benefit you, you should speak to an experienced elder law attorney. Q: Do I surrender any rights when I execute a power of attorney? A: No. A power of attorney allows an appointed agent to act for you in the manner you designate in the power of attorney document. If you permit it, the agent could withdraw money from your bank account or write checks from your bank account. However, you could limit the agent’s authority to specific tasks, or you could provide that certain tasks are not allowed. Nothing in a power of attorney deprives you of your rights because you are still in charge as long as you have legal capacity. If you don’t like your agent, then fire them by revoking the power of attorney. Q: What is an advance directive for health care and should I have one? A: Georgia no longer uses a “living will” or a “health care power of attorney.” The law changed in 2007, when those documents were combined into what we now call an advance directive for health care. The old documents are still legal if you have them, but they are not the right form if you are preparing new documents. Essentially the old “living will” stated your end-of-life preferences if you had a terminal condition or if you were in a persistent vegetative state, and the old “health care power of attorney” designated a health surrogate to speak for you if you were unable to communicate with your health care providers. The new advance directive for health care still covers those bases, but it goes farther. It also allows you to designate who will take charge of your body after you die, whether you prefer burial or cremation, and who would be your guardian if a guardianship petition is filed. Everyone should have a health care advance directive. Remember, Terri Schiavo fell into a coma when she was 27. Q: Can I change my power of attorney or advance directive after I sign it? A: Yes. Powers of attorney or health care directives can be changed at any time as long as you still have legal capacity. Q: What is the difference between a guardianship and a conservatorship? A: Depending on the state, guardians and conservators may have different roles. In Georgia, a guardian is the person who makes personal decisions for someone (e.g., housing decisions and medical decisions), while a conservator manages money and property. In Tennessee, the terms are used differently. In Tennessee, a guardian makes decisions for a minor, while a conservator makes decisions for an adult. Q: Can I rely on what you have written here about Medicaid law? A: No. You should never rely on a web page for your legal advice. This page addresses a few frequently asked questions, but it is impossible to evaluate your specific circumstances here. Unfortunate and costly mistakes can be made if you do not know what you are doing. Q: Should I hire a Certified Elder Law Attorney to help me? A: Yes. You could try to be your own lawyer (or even worse, take advice from a non-lawyer), but if you make a mistake or overlook a strategy that results in your having to pay more to the nursing home than you should have, then you are worse off. You could have used some of that money to pay an attorney and have it done right the first time. Remember: professional help is expensive, but mistakes cost more. You should also remember that it generally costs more to fix your mistakes than you would have paid to have planning done right the first time. Q. Should I hire a non-lawyer to help me? A. There is nothing wrong with hiring a non-lawyer to do non-lawyer work. For example, insurance agents sell insurance and accountants do accounting. But should you rely on a non-lawyer for your legal work? Abraham Lincoln said "He who represents himself has a fool for a client." You have not improved your position if you put yourself in a situation where the blind lead the blind. Some people are penny-wise and pound foolish. They think they can find "a deal" by using a non-lawyer to help them. Non-lawyers don't always know better, and unscrupulous individuals sometimes take advantage consumers trying to save a few dollars. There's a reason why it's a crime to practice law without a license. Non-lawyers can actually make your situation worse by pretending they know what they're doing. Non-lawyers did not spend time in law school learning property law, contract law, tort law, probate law, administrative law, or the host of other issues lawyers are trained to address. They have not been trained on how to pull together the various laws to develop a cohesive plan. They were not "tested" by passing a bar exam. They cannot (legally) appear in court to defend anything they do. They do not attend Continuing Legal Education to stay current on the law, and have no experience reading the law. They have no professional liability insurance if they hurt you. They have no experience practicing law, so they are "practicing" (illegally) on you. There was a news story several years ago about a so-called eye surgeon who "practiced" his technique on oranges before attempting surgery. Not unexpectected, things didn't turn out well and his patients were blinded. That could be you if you ask a non-lawyer to serve as your advocate.